Margery Smith sees her work as preserving the past and saving the future. “We’re preserving these pieces and keeping them out of the landfill for hundreds of years,” said Smith, co-owner of the Strippers. The aptly-named furniture stripping, repair and restoration company is celebrating its 35th anniversary this summer. Starting from humble beginnings — namely in Smith’s home — the company began as a mere stripping service. Growing up in the Wingham area, she always had an appreciation for fine wood furniture and fixing what she had. Combined with the decline of Waterloo Region’s big furniture makers, there was a lot of interest and demand for stripping and refinishing furniture. Working at Mutual Life Insurance at the time, Smith ran into Rita Wagner, a former rival softball player from their days in the Wingham area. Partnered up on the same company team, the two became friends and found they shared a love for furniture stripping and refinishing. In the 1980s, Smith and Wagner saw a dramatic increase in interest for do-it-yourself projects and found a niche — furniture stripping. The stripping, which uses a chemical to essentially melt through the lacquer and stain to reveal the natural wood beneath, was in demand. The process is messy, specialized and tedious. But once it was done, it allowed for the do-it-yourselfers to do the much easier staining and painting part of the process. 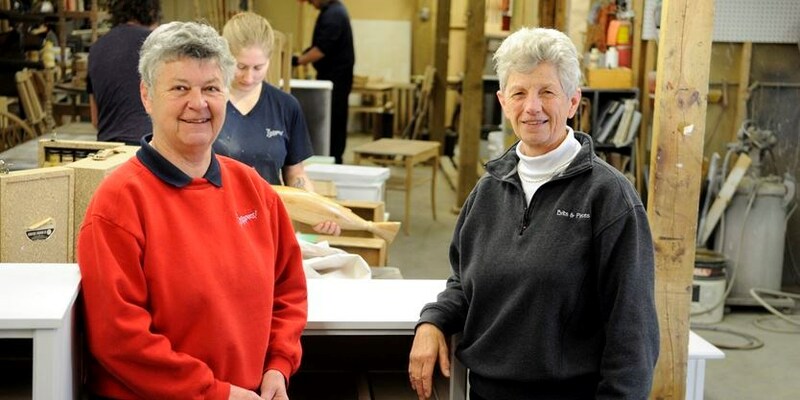 Since then, the company has grown into a full-fledged furniture repair, stripping and refinishing business with four full-time employees at their Gage Avenue location. There are also licensed shops in Guelph, Cambridge, as well as Michigan, that are affiliated with The Strippers. They also operate a consignment furniture store across the road from the main shop, called Bits and Pieces Consignment. It wasn’t always easy for two women to break into the male-dominated industry. “Sometimes people would come in to get a quote and look into the back and say, ‘Oh, is your husband here? Can I talk to him?’” said Smith, adding that most of the time, however, they are respected as professionals in the business. One of the most unique things the pair has seen is the return of the same furniture as it passes through generations and is repurposed. “They come and bring it in. We’re into grandkids now. They’ll come in and paint it white for the kids and strip and paint it again for another purpose,” said Smith. “That’s the advantage of the good quality furniture — you can paint it, strip it, stain it, over and over,” added Wagner. Speaking of good quality furniture, Wagner and Smith aren’t big fans of the Swedish-designed build-it-yourself furniture. “You don’t want to publish what I think about that,” joked Smith. For more information about the Strippers, visit www.the-strippers.com. Adam Jackson is interim editor at the New Hamburg Independent.